You are currently browsing the CrackedActor.com – a David Bowie fan site weblog archives for December, 2009. This is too cute. 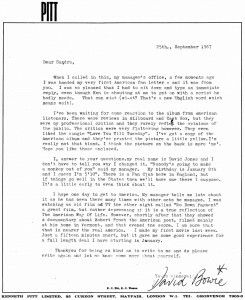 The blog Letters of Note came across a treasure from 42 years ago – the response to the first fan letter that David Bowie received from an American fan. Bowie got a letter from 14-year-old Sandra Adams (now Dodd) of New Mexico when he was 20 years old and wrote his response from his manager Ken Pitt’s office typewriter. The picture from Sandra’s website is below. Note his typo! It’s strange to think back in the days before computers that if you made a typo you could either rewrite the entire document or just live with it and move on. I like Bowie’s choice – to poke fun at himself. Usually I don’t agree with all of the choices for these types of opinion based lists (not even the Seriously Random Lists on my favorite Pajiba), but this time I totally do. Check it out – David Bowie made the number 2 slot for the Cinematical Seven: Most Fashionable Men on Film. Of course I would switch him up to number 1, but I can’t complain too much since not only is Bowie given some due but I like the rest of the choices. Now, if you’ll excuse me I’m going to go dig out our DVD of The Hunger and put it on this week’s To Be Watched pile. It seems like we go through the festival rumor at least once a year. I present to you the latest one: that David Bowie will be playing the Glastonbury Festival. He’s not. Read it from the horse’s mouth on BowieNet. Maybe one year he’ll get around to doing a festival again, but this year sadly will not be it. Magazine and newspaper writer Marc Spitz published a new biography of David Bowie entitled, very simply, Bowie: A Biography. Bowie’s life has been the subject of many a biography and music magazine column, but Spitz wanted to take a different approach with his own work. In an interview with Mr. Media Radio, Spitz said that he wanted to conduct more interviews of Bowie’s acquantainces and to add his own personal anecdotes and thoughts to liven up what could easily be a laundry list of names, dates, and performances. There was a lot of hubbub around Halloween about the infamous story of the white witch that Bowie during his more cocaine-addled days, but I suspect that there is more to the book than just that story. I haven’t read it yet, but if I manage to avoid getting laid off (again) I’ll buy it and read it over the holidays.